The top of a muffin is a delicious cross between a muffin and coffee cake. The sweet blueberry with a touch of tartness is perfect in this buttery cake-like batter flavor. 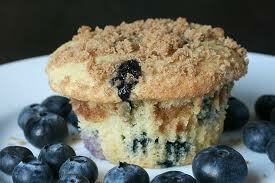 Of course the crowning jewel on our Top of the Muffin is a generous sprinkling of buttery streusel flavor. This is a huge crowd pleaser. Watch for more Top of the Muffin flavors we will be adding soon. Just tried top of the muffin blueberry for the first time and it is not only accurate but it also makes very smooth vapor. Shipping was fast and buying was easy. Someone took the time to hand write a short but personable Thank you note on my receipt! That never happens when you buy online nowadays! Absolutely blown away by the level of customer service! Thank you for sick an amazing buying experience. This juice has become one of my favorites. It has a great blueberry flavor, and goes perfect with my coffee in the morning. I read the reviews on this particular juice to satisfy my blueberry fetish with a close flavoring to something baked... Well... The verdict is pretty awesome!! I can't believe it... It's like biting into a blueberry muffin from Mimi's Café. Oh the richness and aftertaste just lingers in your palates and in your nose... It's truly delightful!! This juice wants you to go buy a muffin from Mimi's Café... That's how good it is!! I'm still tasting the unique flavorings in my mouth and draw from my nose... It's amazing!! Definitely worth giving this a try!! Loved this blueberry muffin ! Tried other blueberry flavors none have anything on this one ! Very smooth ! First, the client service is amazing--I would highly recommend Altcig.com and will continue to buy e-liquids here. As a new vaper and someone trying to kick the analogue habit, the personal note on my invoice was inspiring--thank you! Now on to the blueberry muffin liquid. I am not typically keen on fruit/dessert flavors. This flavor came highly recommended and I had my doubts. On first vape, any doubts I had were replaced with surprise. This flavor is spot-on and wonderful. The flavor isn't overly assertive in my Ego-CC and I can see this easily being an all-day vape. Who would have known? Thanks altcig! I find this flavor to be one of the most accurate I have tried. It tastes precisely like the top of a blueberry muffin! One of the best flavors I've had here (or anywhere). If you love blueberries, this vape is definitely for you. It's heavy on the blueberry and light in the muffin. You get a strong blueberry inhale and light muffin on the exhale. Only thing missing from this was a little butter on top. All in all a very good vape! Just loving this one..great for mornings or anytime..! I am surprised no one has reviewed this. This is how I start my day. Puffing the muffin!! This is a very good flavor, nice strong blueberry with no funkiness (is that a word?) it could maybe be a lil stronger in the muffin part, but the blueberry is spot on! It's great to add a lil to the waffle or even the gooey butter cake!